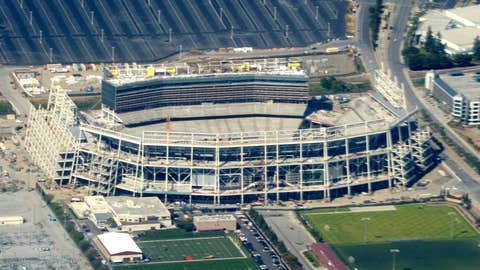 The San Francisco 49ers will move into their billion-dollar Mecca in Santa Clara next season, but a lack of parking in the area around Levi’s Stadium will reportedly keep the team from hosting weeknight games in the immediate — and potentially foreseeable — future. But it’s still unknown what the team would do to accommodate a game day crowd on a Monday or Thursday night, when games kick off at 5:30 p.m. ET, while many employees in nearby businesses are still at work. As a result, there will be no weeknight games in San Francisco in 2014, and potentially longer. For example, Nearby Mission Community College is said to be renting the team 2,200 parking spaces on Sundays but said it can’t make that commitment during the week. And there’s a thought that the Niners might face similar pushback from other businesses in the area, as well. Perhaps everyone will have a better idea how a weekday game will pan out (and how to best plan for one) after Cal hosts Oregon at Levi’s Stadium next season in a Friday night game that was scheduled in Santa Clara because of — what else? — parking issues at Cal’s home stadium in Berkeley. • Jesse Owens’ 1936 Olympic gold medal sold for nearly $1.5 million at auction. • The Detroit Lions get heckled by everyone — including the homeless.